This Saturday night's Gatherings-concert-event/STAR'S END live-radio-concert combo has filled me with so many wonderful memories. Finding a way to organize these thoughts into words is going to be a challenge. My strategy here in doing so might be compared to how so many ambient-spacemusic artists "go about" performing live: by "winging it." I had little in the way of knowledge of either group of artists before taking my seat in St. Mary's Saturday night. I've not been able to tune into STAR'S END for the past several weeks, as a contractor, in the process of absorbing nearly a year's worth of my salary in reconstructing my house, ripped down my rooftop antenna. This antenna had linked me with WXPN's rather weak radio signal for years. (I'm not lying when I say that my neighbors still roll on the ground with laughter telling the story of my being enraged and chasing my Bob-the-Builder wannabe down the street with my antenna sticking out his rear end.) STAR'S END playlists have recently revealed the inclusion of music by Suzanne Teng and Blow Up Hollywood, but I haven't been hearing any of this. Suzanne Teng is the loveliest performer to have ever graced a Gatherings' stage. She also has the personality and grace to match this beauty. 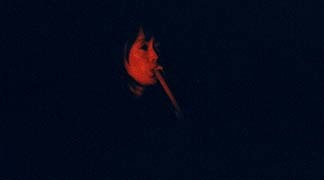 Saturday night, Teng would perform on a variety of flutes, ranging from alto to bass, and some of international design. 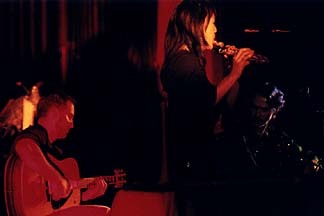 Teng appeared with her partner, percussionist Gilbert Levy, and was joined for the majority of her performance by a local (Philadelphia) guitarist/string-specialist (I only captured his first name) named Bill. 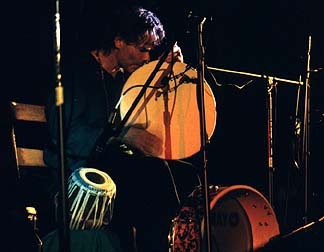 Teng spoke briefly between songs, offering descriptions of the culturally influenced instruments and stories relating inspirations behind the music. 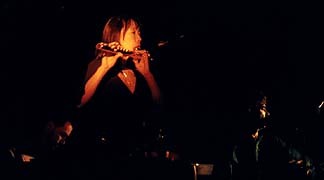 The hour-long set was intimate and spiritual, beginning and concluding, in Teng's words, "In a manner of which an ambient-concert-series performance should," that being softly, in her case with soothing sounds of the flute and guitar, and gentle, hypnotic percussion. However, and this is a big HOWEVER, the ensemble did let its hair down with an incredible piece, late in the set; "Fertile Crescent" its title. Teng writhed seductively here, literally "blasting" a wide variety of flutes, inviting us all to dance, clapping in time, screeching vocally; with guitarist Bill and percussionist Levy revealing absorbing, unrestrained musical talents. In his review, John Garaguso does a splendid job in describing the sonic wonders provided by Blow Up Hollywood. 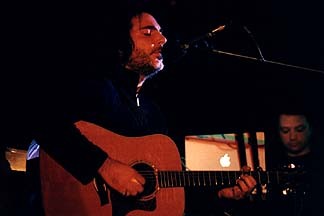 As did Garaguso, I took part in attending both the Blow Up Hollywood stage and radio concerts. But, as mentioned above, I had no ingoing expectations. Let it here be known, from the outset of Blow Up Hollywood's performance I knew I would experiencing something different and exhilarating. Oh, there have been "vocal" moments in Gatherings past (with none more uplifting than those of Spectral Voices), even of the song-type variety (a group called Monk immediately comes to mind), but Steve Messina's metaphysical reaches and vocal climaxes produced chills here. It is at these culminations when the music of Blow Up Hollywood reaches full focus, these vocal songs are near-ballads; and Messina's voice, especially within the confines and acoustics of St. Mary's, offers a richness of sound beyond description. These climbs would be gradual, rising from the depths of discord, truly effecting a working-contrast of Blow Up Hollywood's appeal; the sadness, the beauty, the elation ... an understanding. 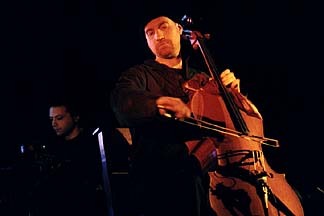 Cellist Dave Eggar sat at the front of the stage. The sound of his instrument, through his interpretations, offer the band its most distinctive characteristic. Eggar wore a beanie, and was often found staring blankly into the blackness of the audience. Each member of this band qualifies at the same wavelength, stoic, though not-quite shoegazing. The strategy of Blow Up Hollywood's set has me drawing comparisons (albeit vaguely) with that of Genesis's "The Lamb Lies Down on Broadway," with the sometimes discordant, valley-like musical interludes intermixing with apexes of sound and voice. Some final thoughts: Blow Up Hollywood, if you're listening (and taking advice)... release a two-CD set combining the two concert efforts tonight. John Diliberto did a wonderful job hosting the festivities at St. Mary's. Sadly, Art Cohen was missing in action, having another commitment. Jeff Towne remains a magician; while under the gun of incredible time-constraint and pressure, this wizard of wires put together the radio concert in remarkable fashion. To Chuck van Zyl: I hope you are finding yourself a happy and at-home in the new WXPN studios. I know what the old place meant to you, and to many of the artists on this list that have performend there. Lastly, I also wanted to give myself a little credit for coupling a few million wires last night, effectively creating a nice Hansel-and-Gretel/I-can-now-find-my-way-around-the-studio path between point A (the studio containing Jeff and Blow Up Hollywood) and point B (the studio from which Chuck was hosting the show), enabling myself to walk WXPN's hallways without getting totally lost. Blow Up Hollywood performed last Saturday at The Gatherings Concert Series and followed that performance a few hours later with a live on-air performance on the widely respected STAR'S END radio program, aired weekly on Saturday nights beginning 1AM until 6AM Sunday Morning on WXPN, 88.5fm in Philadelphia. The performance at The Gatherings was a wonder to behold, both visually and sonically. Blow Up Hollywood's music is serene and sometimes melancholic, often times melodically beautiful, and quite disturbing at others. The two performances reminded me of the chameleon, changing to hide within their environment while the music carries the listener to places never inhabited. Both of their performances were completely different in feel and I came away mesmerized and with a new found respect for this band. 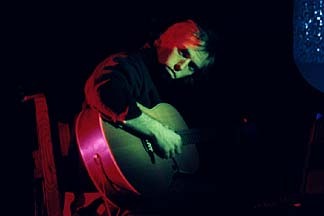 Anonymity is a long-standing tradition within this band. There's no bio on their website, (which if you've never visited it, I highly recommend you do so. It's like no site I've ever seen before), their CDs list no band member's names, and each song's author is nameless. Steve Messina, who's recognized, albeit begrudgingly, as the official leader of the band, has said in interviews that the Blow Up Hollywood's primary mission is to release music from the heart, fresh, original, and free from battling egos and personalities. This way the music can live a life of it's own. And their music definitely evolved to great heights last night. Blow Up Hollywood is actually a 7 member band, all of whom have played together for years and who also have separate successful careers of their own. They're all highly accomplished musicians with members who've trained at some of the most prestigious music schools in the country. They have degrees from Temple, Harvard and Julliard and have studied under such legendary musicians as Aaron Copeland. Last night only 4 musicians made the trip to Philly and they were also accompanied by their manager Karen Lee and her partner from Evolution Promotions, Karen Doran, as well as their visual gatherer, Spence. The Gatherings Concert Series is most commonly known for featuring electronic music, performed by only one or two musicians on keyboards and maybe a guitar, but last night was a huge step forward, or sidewise, for The Gatherings. Blow Up Hollywood featured a keyboardist, an acoustic guitarist and singer, (a first for the Gathering I believe), an electric guitarist who also played keys, and a cellist. Their performance gracefully maneuvered through instrumental atmospheres and somber melodic vocal pieces, never breaking stride and flowing seamlessly into one long continuous enjoyable set. 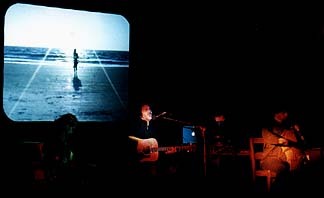 Their performance was accompanied with a visual backdrop where a video montage was shown while the band was playing. 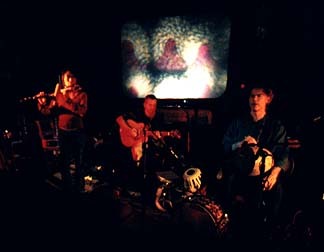 The band mostly played in the dark, almost as if scoring to the visuals, while the images on screen swept the listener into a bizarre abstract world of hallucinogenic imagery and thought provoking film clips. 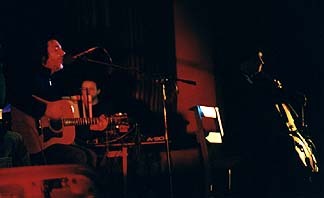 Later that night on the STARS END radio show, the band displayed a completely different side of their musical personality by playing a one hour non-stop improvisational ambient performance. Those of us in attendance could only watch and listen in awe as these accomplished musicians embarked on a journey of sound and song, never knowing their destination or how they would get there, but traveling it with an unwavering confidence. I left the building that night with a completely new appreciation and respect for these musicians.